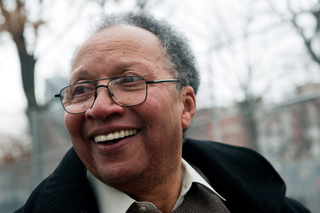 Renowned author of young-adult fiction Walter Dean Myers, who made a mark for himself by writing books about young African Americans, has passed way at 76, the Los Angeles Times reports. "Walter's many award-winning books do not shy away from the sometimes gritty truth of growing up. … He wrote with heart and he spoke to teens in a language they understood," Susan Katz, president and publisher of HarperCollins Children's Books, said in a released statement, according to the Times. The author passed away on Tuesday after a short illness. The brutal honesty in the West Virginia-born, New York-raised author's books came from his own experiences always getting into trouble as a youth, the Times notes. Myers, who admitted to hanging out with gangs, eventually dropped out of high school at age 17 and joined the Army, where he started to write. “A turning point for me was the discovery of a short story by James Baldwin about the black urban experience. It gave me permission to write about my own experiences,” he once wrote, according to the Times.